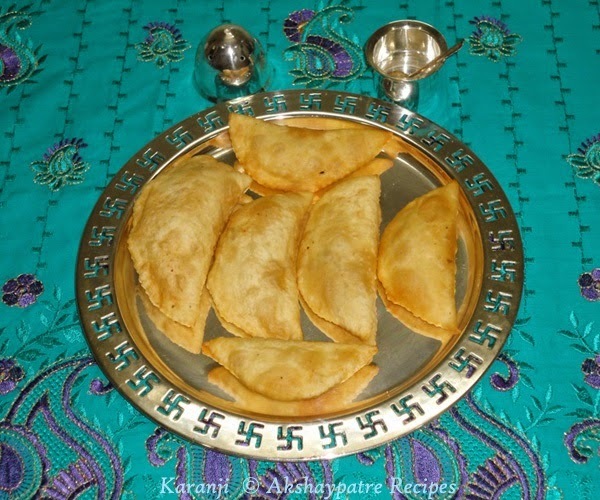 Maharashtrian karanji recipe - Diwali season is in the air. This is the right time to make sweets and savouries. The most popular sweets and savouries are Karanji, Ladoo, Burfi, Halwa, Pedha, Chakli, Shankarpali, varieties of Sev, Chivda, roasted spicy Cashew Nuts, salted Pistachio and processed Dates. My preparation of Diwali sweets and savories as started with Karanji. 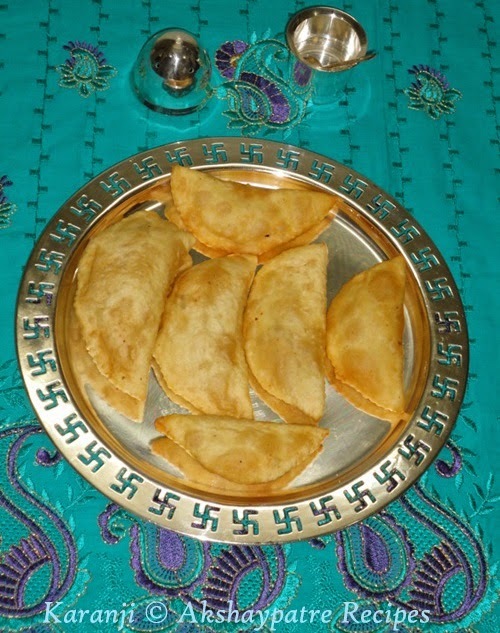 Karanji is a delicious, deep fried snack, that is especially prepared for Diwali festival. Karanji is also known with different names in different parts of India. Gujiya in Hindi, Ghughra in Gujarati, Karjikayi in Telugu, Karachika in Tamil, Karagadabu and Karjikayi in Kannada, Nevri in Konkani. 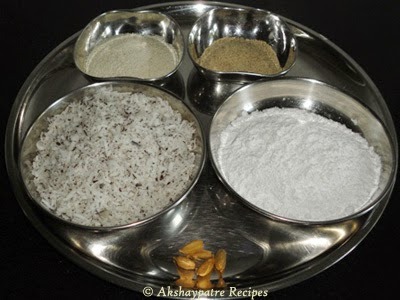 Dry coconut, poppy seeds, rava, powdered sugar and cardamom powder are essential ingredients in karanji filling. 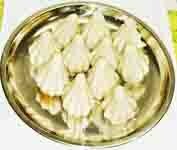 Today, I am posting Karanji, my first Diwali Sweet of this year. The Karanjis can be stored for about a month in an airtight container. The filling mixture can also be stored for about a month in an airtight container to prepare fresh karanji as and when needed. One can have varieties of Karanjis by changing fillings according to the likings, such as fresh coconut and jaggery, mava and dry fruits, chana dal and jaggery. Take the rava, maida and salt in a large plate. Add water gradually and knead a dough of rolling consistency. Keep it covered for 30 minutes. Heat a frying pan, add poppy seeds. Roast till crisp. Remove and transfer to a large plate. In the same frying pan, add 2 tsp of ghee. Once the ghee melts, add rava and saute till aromatic. Remove to a plate. Now add grated dry coconut. Roast till aromatic and crisp. Switch off flame. Remove and transfer to the plate. Allow to cool. Once the poppy seeds, rava and coconut cool, add powdered sugar, mix well. While mixing slightly crush the mixture. Filling is ready to use. Roll the small round disc that is poori size. Put 1 ½ tbsp of above prepared stuffing in the middle of it. Fold the disc in the middle, lift the edges from one side and join them properly. Press the edges, just soak finger tips in milk and seal them firmly. Trim the edges with a cutter. Prepare all the karanjis and place them on a large plate. Heat oil in a frying pan. Once the oil is hot, slowly slip the karanjis from one side. Fry 2-3 karanjis at a time, keep enough space in oil to flip the karanjis. Fry the karanjis on a medium low flame till they become golden brown from both sides. Remove with a slotted spoon, transfer to an absorbent paper. Store the karanjis in an airtight container. 1. Take the rava, maida and salt in a large plate. Add water gradually and knead a dough of rolling consistency. Keep it covered for 30 minutes. 2. Heat a frying pan, add poppy seeds. Roast till crisp. Remove and transfer to a large plate. 3. In the same frying pan, add 2 tsp of ghee. Once the ghee melts, add rava and saute till aromatic. Remove to a plate. Now add grated dry coconut. Roast till aromatic and crisp. Switch off flame. Remove and transfer to the plate. Allow to cool. 4. Once the poppy seeds, rava and coconut cool, add powdered sugar, mix well. While mixing slightly crush the mixture. Filling is ready to use. 5. Roll the small round disc that is poori size. Put 1 ½ tbsp of above prepared stuffing in the middle of it. 6. Fold the disc in the middle, lift the edges from one side and join them properly. Press the edges, just soak finger tips in milk and seal them firmly. 7. Trim the edges with a cutter. Prepare all the karanjis and place them on a large plate. 8. Heat oil in a frying pan. Once the oil is hot, slowly slip the karanjis from one side. Fry 2-3 karanjis at a time, keep enough space in oil to flip the karanjis. 9. Fry the karanjis on a medium low flame till they become golden brown from both sides. Remove with a slotted spoon, transfer to an absorbent paper. 10. Store the karanjis in an airtight container. Karanji looks perfect and delightful. I still have to make this, maybe after some containers will get empty then make it. looks just perfect. Excellent karanjis, feel like munching some. This comes under few desserts that i luv.. well made vidya..